Check out these sizzling summer fiesta recipes…all with a little Latin flair! Everybody loves the sweet summertime taste of watermelon. Refreshing and tender, it blends perfectly with the citrus flavors, as well as with the cooked shrimp and the delicate spark of jalapeño. You can make the citrus mixture ahead of time and then simply add the slightly undercooked shrimp 15 minutes before you’re ready to serve it, to allow it to “cook” through. For the melon chunks, which add color, style, and texture to this ceviche, I like to use an oval fluted melon baller. Combine the citrus juices, watermelon juice, vinegar, and jalapeños. Add the shrimp and mint and let sit for 15 minutes. Stir in the red onion, peppers, and salt and pepper to taste. Add the watermelon balls. Serve in chilled martini glasses, garnished with fresh mint leaves. Makes 4 appetizer servings. When we started serving brunch at Pacífico, I wanted to create a menu of breakfast items with a Latino flair — and still keep with our seafood theme. This wrap has been a consistently popular item. Easy to make and serve, it is perfect brunch finger food! Combine the lobster, celery, red onion, and mayonnaise in a medium bowl. Mix well. Add the lime juice, salt and pepper to taste. Set aside, or cover and refrigerate for 1 to 3 hours. In a small bowl, beat the eggs until well blended. Pour into a large nonstick sauté pan and cook, stirring frequently, over moderate heat until done. Remove from the heat, and combine with the lobster salad. Place half of the mixture along the center of a tortilla in a horizontal line. Roll up the tortilla so that it’s in a cigar shape. Use a sharp knife to cut it into 4 slices, and stand the slices up vertically. Repeat with the remaining tortilla and lobster mixture. Top each slice with just a bit of the mayonnaise and a sprinkle of chives. Serve immediately. Makes 2 wraps (8 appetizer servings). Whenever my writer, Arlen, has a barbecue—which is just about every Sunday in the summer—she makes this salad. This colorful salad, which she believes has Italian roots (at least in her family! 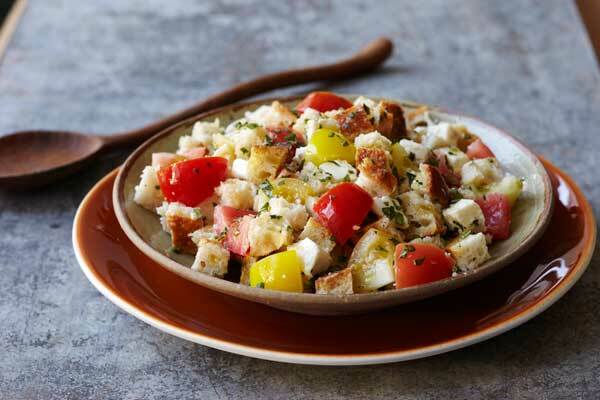 ), makes great use of leftover bread, as well as fresh tomatoes and basil. It’s not only simple, fresh, and tasty, it’s also very flexible. You can vary dressing according to your taste, or add different ingredients such as cucumber, mesclun lettuce, daikon radish — even potatoes. In a bowl, mash the garlic pieces to a paste, using a pestle or the back of a spoon, along with a pinch of salt and pepper. Add the vinegar, and whisk in oil until blended. In a medium-size bowl, combine the bread, mozzarella, tomatoes, and basil. Pour the oil and vinegar mixture on top and stir to coat. Let the salad stand at room temperature for about 15 minutes to allow the bread to soak up the dressing before serving. Serves 4. Even before I worked with Mark Miller — the “founder” of Southwestern cuisine — I was smitten by barbecue sauces. Mark’s passion for his cooking inspired me to make sauces using the flavors I knew and loved. (This philosophy is what drives all of my creations—both inside and outside the restaurants!) In this combination, the sweet-tartness of passion fruit makes it a natural for a barbecues sauce, and the slight bite of the smoky jalapeño also adds balance and depth. 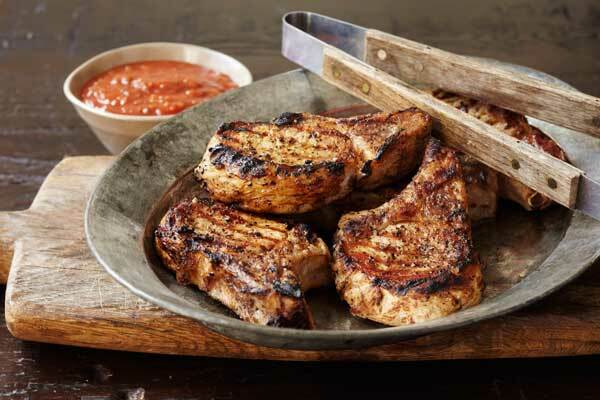 And remember, a barbecue sauce is versatile; here I’m using it to top off the fabulous flavors of grilled pork, but you can certainly use it with other meats — like grilled chicken. Also, once you make it, I’m sure you’ll find other ways to have this sauce be a frequent visitor to your fiestas! Serves 4. Grilling the pineapple enhances its natural sweetness; the caramelized fruit complements this mint and lime cocktail. For more than one serving, simply multiply accordingly. 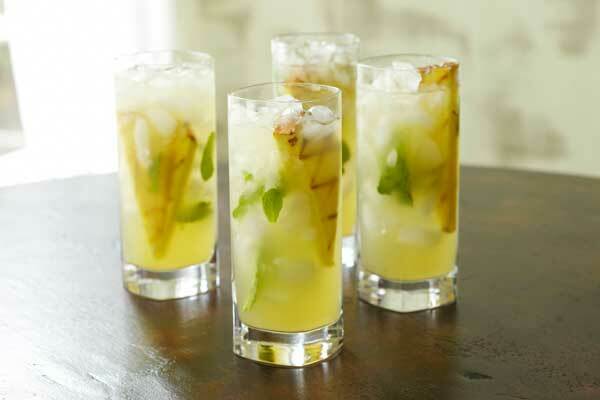 In a large bar glass, combine the pineapple, mint, and lime. Using a pestle, muddle them just until you’ve broken up the pineapple a bit and released the juice from the lime. Add the ice, rum, and sour mix. Cover and shake vigorously. Pour into a bar glass, top off with the club soda, and serve. Serves 1.